Every spoiler season, you can catch me looking over the new cards and imagining how they line up in Modern. “I wonder if this card could work?” Invariably, I’ll make a bunch of lists and bring them to battle on Cockatrice. I lose. I fix the list. I lose some more. After a full day of losing, I’ve gotten my answer: a predictable “no.” But I’ve also gained something more valuable: the reason why. When someone at my local game store asks me what I think of X impressive spoiler card, I can tell them not just my opinion, but the reasons it doesn’t work in Modern. Or the reasons it does, and why I’m excited about it! Many players in my entourage consider me the group’s brewer. But brewing isn’t some grandiose activity. Everyone I know brews in some capacity, even if they’re just looking at spoilers and thinking about how cards interact with the format. And even brewers have their bad days. In fact, I’d argue that for every successful brew, a deckbuilder has drafted ten or more heaps of garbage. This article takes out that trash by looking over two of my recent concoctions that didn’t work out and examining their downfalls. Mantis Rider is a pet card of mine, and in my opinion exemplifies the Modern “Bolt Test.” Unlike other three-mana, three-toughness creatures that don’t cast spells (Vampire Nighthawk is the big one), Rider really rides the line, perpetually on the cusp of Modern playability. After all, it does kind of cast Lava Spike. We’ve actually seen Rider decks pop up over the last two years, from Jeskai Haste (which this deck is modeled after) to Jeskai Prowess, to 5-Color Ziggurat Aggro. This deck is something I whipped up when Spell Queller started to gain some traction in Modern. I’d already experimented with Mantis Rider in Modern, compensating for his weakness with body-buffing enchantments and Mutagenic Growth. Queller can be saved in the same way, leading me to try putting the two in one shell. Adding Spell Queller made me think I could cut back on threats, but I found myself frequently wanting Lightning Angel in the list. I eventually settled on two, but can see cutting one for another piece of interaction now. I actually started with Disrupting Shoal in this list before transitioning to a more diverse counter package. The Shoals were much too slow for my liking. Since this deck boasts no acceleration and counts on casting three-mana creatures to win, it must be able to interact during the game’s early turns. Remand and Spell Snare do just that, complimenting Path and Bolt as additional answers whose diversity is rewarded by Snapcaster Mage and Serum Visions. Nixing Shoal also lets us run Honor of the Pure over Favorable Winds. This switch has a negligible impact for Game 1, but turns Timely Reinforcements from the sideboard into a three-mana Siege Rhino. The upgrade is significant enough to run three copies of Timely in the board, since we can bring it in for a plethora of matchups once it becomes stronger. Gitaxian Probe smooths out our early turns, gives us a reason to cast Snapcaster on turn two if we don’t have anything else to do, and grants us crucial information for when we don’t have an Honor. Casting Mantis Rider right into a Lightning Bolt is about as terrible as it sounds, and having a Probe to make sure the coast is clear can win games. Honor Queller has the same problem as its Mantis-Riding forefathers: it’s a little too cute. Mantis Rider is not a playable Modern card in its own right. We have to jump through hoops to make it good. Casting, resolving, and sticking a two-mana enchantment that doesn’t impact the board on its own might be too high a hoop to jump through, though. Even if we land the Honor, there’s no guarantee we have Rider or Queller waiting in the wings. And even if we do, opponents might already be en route to a victory of their own, something a turn-three Queller won’t do much to halt. And there’s the possibility our opponent doesn’t even play Lightning Bolt, invalidating our need for Honor altogether and giving us four functional blanks where we’d much prefer relevant interaction. Our primary gameplan of enchantment into three-drop also isn’t that consistent. Curving Bolt into Honor into Queller is great, but it realistically doesn’t happen that often. Besides, that plan leaves a whole turn—the all-important turn two, no less—for opponents to resolve Tarmogoyf, Cranial Plating, or any number of other nasty spells scot-free. Serum Visions helps with this issue by setting up our future turns, but we have a three-drop and no Honor pretty often. Because of the cuteness issue, it would be unwise to load up on more Honor effects than we already play. The simplest way to fix this deck is with a dramatic overhaul. For one, I think we should abandon Honor effects and go back to Mutagenic Growth. Honor effects pump our whole team, but they limit us to playing a very specific set of creatures. Next, we should play creatures that already pass the Bolt test but which also benefit from Mutagenic Growth. Guides and Swiftspears would do a great job of complimenting Mantis Rider in that kind of shell. Unfortunately, that doesn’t leave much space for Queller. I think the Spirit is best relegated to the sideboard in a strategy that aggressive. One of my longstanding Modern projects is to grow huge Goyfs in aggressive Gruul shells. When Bomat Courier was spoiled in Kaladesh, my interest in this strategy was piqued again. Goyf Sligh is a creature-heavy Burn deck that insures its fragile one-drops with a set of Tarmogoyf. The deck has roots in Legacy, where it was first created shortly after Tarmogoyf proved his competitive worth and clawed his way out of bulk boxes across the world. If Modern is defined by one card, it’s Lightning Bolt. 40% of the format’s decks play a set, putting tons of pressure on creatures with less than four toughness to perform. Goblin Guide, Monastery Swiftspear, and Wild Nacatl are all obvious targets for a main phase Bolt, and chasing them with Tarmogoyf ensures a bad time for most decks looking to interact. Goyf Sligh’s most impressive feature is its mana curve. Given the deck’s high density of one-drops, it frequently leads on a creature and can follow up with two more, one creature and a removal spell, or a Tarmogoyf should the first attacker die on sight. Eidolon of the Great Revel aids this plan greatly. Slamming Eidolon after sticking a Guide or Swiftspear puts opponents in a very tight spot, drawing removal away from potentially superior combat creatures while taxing them life. Eidolon has another benefit in this shell—he grows Tarmogoyf! Since Eidolon is an enchantment, he helps bring Goyf to the mighty 5/6 level, which is large enough to trounce most creatures in Modern. Goyf Sligh fortunately has enough space to run a couple Tarfires, maxing the beater out at 6/7. Early-game Goyfs are usually 3/4 in Modern and already nothing to sneeze at; Goyf Sligh’s late-game Goyfs are essentially two of them. The idea with Bomat Courier was to have another one-drop to compliment Guide and Swiftspear without going off-color by dipping into white for Wild Nacatl. Courier would pressure opponents from a unique angle, threatening to refill us on cards once we spent them all (an easy task in this deck) and forcing them into awkward spots with their removal. Shooting Bomat Courier isn’t too appealing when the Construct can just pop itself in response and draw its controller three cards. This build maxes out on key pieces and sprinkles in some second-tier Burn options to fill out its bulk. Cheaper Burn staples like Lava Spike and Rift Bolt are integral to the strategy, since they empty our hand quickly for Bomat Courier. Tarfires in excess of one are generally pretty bad, so we max them out at two. Searing Blaze also earns a couple of slots. In the matchups we want it for, it’s our best card, but it can be dead in others. Atarka’s Command is the best burn spell in the deck. With so many creatures, Command often deals more than four damage, which is a terrific rate for two mana. It also protects Swiftspear from Lightning Bolt, and Guide and Eidolon from Pyroclasm. Another important aspect of Command in this list: it wins Goyf wars. Nothing ruins Burn’s day like an opposing Tarmogoyf, and Atarka’s Command gives us a mainboard way to ensure our Goyf fights theirs to the death. As for the manabase, I chose to play the full four Copperline Gorges. Once we get to three lands, we don’t usually mind if our other ones come into play tapped, even with Courier drawing us cards. 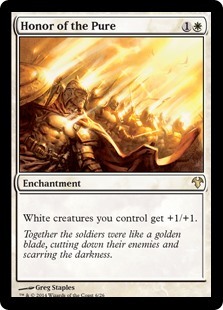 Gruul colors allow us to play fewer than 12 fetchlands. On to the sideboard. Without access to Lightning Helix, I feel Feed the Clan is a necessary evil to fight enemy Lava Spikes. Ghor-Clan Rampager helps us connect with our little guys while pushing through damage, and Mutagenic Growth saves Guide and Swiftspear from Lightning Bolt. 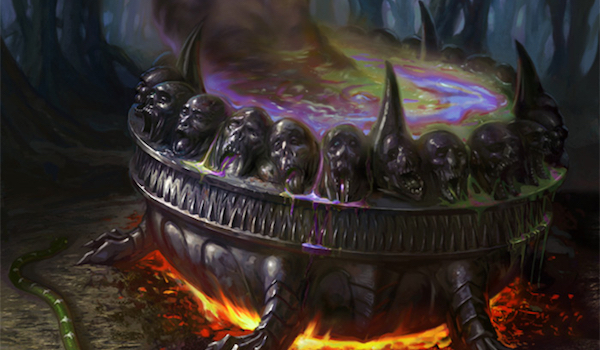 The rest is standard-issue for Modern’s Burn decks. I built this version of Goyf Sligh assuming a lofty premise: that Burn wants a set of Tarmogoyf in the first place. But if Burn wanted Goyfs, wouldn’t it play Goyfs? I think a case can be made for the little guy’s inclusion in this kind of shell, but making that case would require actual testing. The problem with this build is that it took a deck that might already just be a worse version of Burn (or of Gruul Zoo) and dropped in four more totally unproven cards: the Bomat Couriers. In testing, Bomat was frequently a flop, drawing me one to two cards and choking my mana development. When I missed my third or even fourth land drop, being forced to hold up a land all the time to play around Lightning Bolt really stunk. I started throwing caution to the wind and neglecting to hold up mana for Bomat. Opponents sometimes just killed the Construct, but only when I needed the cards. Other times, they would go for Swiftspear or Guide, leaving me with a tiny artifact that couldn’t connect through my opponent’s 2/2. Bomat Courier is really a punisher card at heart. Its tendency to let opponents choose when to leave it alive brings it from suspicious to unplayable. First thing’s first: Courier has to go. I’d replace the Construct with a proven one-drop, Wild Nacatl, and add one Sacred Foundry to the manabase. That’s probably a decent starting point for some testing, which would give us an idea of whether Goyf Sligh could prove viable in Modern. Brewing is really a numbers game. The two above examples don’t do justice to the sheer volume of terrible brews I’ve concocted over the last few months. But hey, they can’t all be hits. If we always brew to come up with a winning deck, we’re in for loads of disappointment. Conversely, brewing with the goal of better understanding the format and its interactions promises a wealth of experience that will incidentally help any brewer improve. Next time you find yourself asking, “Could this work in Modern?” remember that the yes or no answer is also the least interesting one. Try responding with, “Why not?” and find out for yourself! I don’t usually like posting my brews. But since I share a pet love of Mantis Rider. The more the time passes the more I feel the Bolt test is just a poor excuse. Just look for example at current modern breakdown. How many of those decks run bolt? Burn (if targets your creature it means effectively +3 life), jund (where bolt is the real deal), and jeskai control. That is not such an oppressive presence, specially now that jund is only 6.5%. While its true that 2cc 3/3 does not cut into modern, that is not simply because of bolt, since bolt is just one of the threats present and not much more present than decay for example. Decay kills goyf.. so why are people not saying that goyf sux because of it fails decay test? Because when it does not die it is very dangerous. Same way a 2cc creature 3/3 flying lifelink would see play, even while failing the bolt test. That is where the mantis fails, not at the bolt test, but at the TURN 2 test! A creature must have a special unique capability or be stronger than goyf or faster than goyf to see play in modern. Mantis is slower than goyf and WEAKER than goyf! The real test in modern is the GOYF test, not the bolt test! Seen in this way, Goyf DOES pass the Abrupt Decay test. It trades profitably (2 mana for 2 mana, 1 card for 1 card), and if left unchecked can easily win a game. Mantis Rider trades 3 for 1 mana vs. Bolt, and is a slower clock than Goyf. All that said, while I think Bolt is definitely one of the major constraining factors in the format, it’s not the only one. You’re correct that Goyf constitutes another bar cards must clear. I agree with Jason. In such a tempo-centric format, losing stock mana from having an inefficient creature Bolted is often devastating. More on this in six hours!